In his practice, Dr. Sileo works with children, adolescents, adults, and families. Since 2010, he has been consistently recognized as one of New Jersey's top kids' doctors. He is the author of six other children's books: Toilet Paper Flowers: A Story for Children About Crohn's Disease, Hold the Cheese Please: A Story for Children About Lactose Intolerance, Bug Bites and Campfires: A Story for Kids About Homesickness, Sally Sore Loser: A Story about Winning and Losing, Don't Put Yourself Down in Circus Town: A Story About Self-Confidence, and A World of Pausabilities: An Exercise in Mindfulness. His books Sally Sore Loser, Don't Put Yourself Down in Circus Town, and A World of Pausabilities are the Gold Medal recipients of the prestigious Mom's Choice Awards. He has also won Silver Medals from the Moonbeam Children's Book Awards and the Independent Publisher Book Awards. Dr. Sileo speaks across the country and does author visits. Dr. Sileo has been published in psychological journals and is often quoted in newspapers, magazines, podcasts, webcasts, radio, and television. 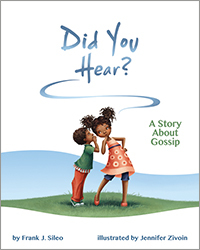 This book uses serious and silly rumors to illustrate the concept of gossip and how it spreads and transforms. While gossiping is a natural human behavior, it also describes what hurtful gossip feels like, how can be like bullying, and what to do to stop it. Illustrations take readers through a day in a little girl's life and the gossip around her as the kids around her ask "did you hear?" A "Note to Parents and Caregivers" is included that describes how gossip can have negative effects, whether intended or not, and what can be done to prevent it.